Partnering with Take The Lead, Together Live sets off on a 10-city tour to inspire women to change the narrative of their lives. Learn strategies that are effective to find creative solutions and innovations with your team. Pinch co-founder, Rocksbox founder Maia Bittner offers ways to hire the right people in tech. Volunteer your time, supplies, expertise or funds to those affected by Hurricanes Harvey, Irma and now Maria. You don't have to live in Texas or Florida to reach out to offer assistance. The 69th annual Emmy Awards salute the importance of women's stories, per Nicole Kidman, Reese Witherspoon, Lena Waithe, Ava DuVernay and more. "Tell your story" is Leadership Power Tool #9. The future looks brighter with more female chief digital officers. That's what all the winners and nominees reminded us was true. There will be more women CEOs than men in 20 years. New study shows men don't understand the scope of sexism at work. Study shows women earning in the the top 2% make 39 cents per dollar compared to men. A new study appropriately titled, "Boxed In," shows little progress for all women in broadcast. "The truth is, men still run the world and I'm not sure it's going that well," she said. 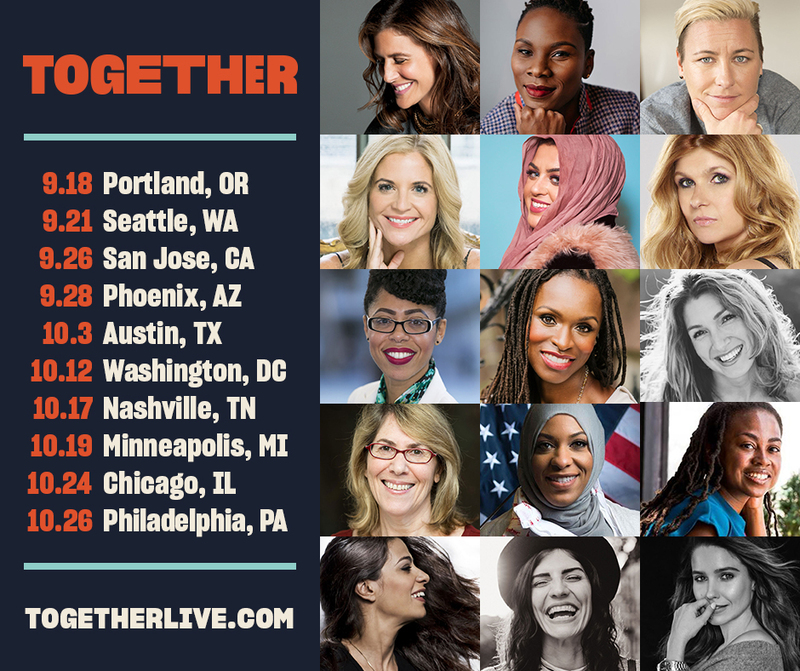 Together Live is in 10 cities across the country from September 18 through October 26. Use our special discount code MIGHTY and save between $5 and $10 per ticket in any city. Applications are open for a few available seats for The 50 Women Change The World Leadership Program in the nonprofit and social profit sectors in Arizona, including community, government and social impact leaders.